Similar to Searsâ€™ Kenmore brand, Admiral is a brand name used by Home Depot to sell appliance products made by Whirlpool. 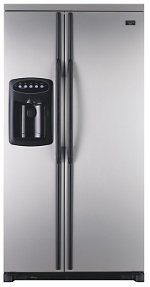 The Admiral model SAF224GB refrigerator. Admiral started as the Continental Radio and Television Corporation, founded by Ross Siragusa in 1934. The company produced consumer electronics, such as radios and phonographs, and was renamed the Admiral Corporation in 1940. During World War II, Admiral supplied the United States military with electronic equipment and sponsored the CBS Radio Networkâ€™s "World News Today" weekly news program. After the war, Admiral branched out its product line to include larger household appliances, including refrigerators. The company would later be bought and sold by a list of larger companies, starting in the 1970s. Admiral was acquired by Magic Chef, which was in turn acquired by Maytag. Maytag itself was later acquired by Whirlpool in 2006. In the early 1990s, Montgomery Ward & Co. contracted with Maytag for exclusive use of Admiral branded products (most of which used on Zenith-made products) in their stores. Montgomery Ward & Co went bankrupt in 1999 and closed down all of its stores. Upon Whirlpoolâ€™s obtaining of Maytag, Admiral became the exclusive brand for Home Depot. Most Admiral brand refrigerators use Whirlpool refrigerator water filters, as well as those made by Whirlpoolâ€™s subsidiaries.